Inflammation is your body’s way of protecting itself from harmful stimuli, including damaged cells, irritants, or pathogens. To clear things up: infection is not the same as inflammation. Infection happens when a bacterium, virus, or fungus invades your body, while inflammation happens when your body tries to remove those invaders. Inflammation plays a critical role in maintaining your body’s immune system and heart function, which means that it is responsible for keeping us healthy. However, inflammation is common for heart disease and stroke patients, and high levels of inflammation are believed to be a sign of declining heart health. Exactly how inflammation plays a role in our cardiovascular system is a topic of ongoing research, but inflammation around your heart can result in an inflammatory response—which makes this biomarker a good proxy for seeing how our heart is doing. Learn how InsideTracker can help you improve your heart health by providing you with personalized nutrition information! Inflammation affects everyone, but it is especially important for people to control inflammation in order to stay healthy, feel good, and be at peak performance. One of the best inflammation indicators we have is a protein in the blood, called C-reactive protein (or CRP). Levels of CRP rise and fall in response to increases and decreases in inflammation, so knowing your CRP measurement tells you a lot about what’s going on in your body. According to the American Heart Association and the Centers for Disease Control and Prevention, a CRP concentration of below 1.0 mg/L indicates low risk for heart problems; between 1.0 to 3.0 mg/L is an average risk for heart problems; above 3.0 mg/L as high risk for heart problems. Very high levels of CRP (more than 10 mg/L) can also indicate impaired immune response or inflammatory disease. White blood cells are another indicator of inflammation because they play an important role in your body’s immune system, searching the blood for invading viruses, bacteria, and fungi. The only way to truly determine if your CRP and white blood cell levels are too high is to get your blood tested. InsideTracker measures these biomarkers in the Performance Panel. 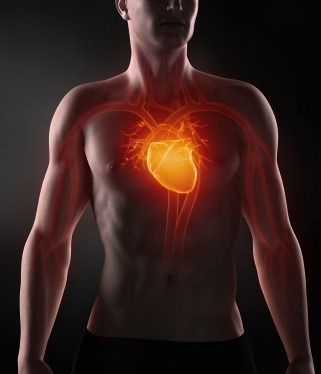 More and more research is pointing towards an association between heart health and inflammation. Why? Inflammation causes the inner linings of the arteries to swell, which narrows the opening through which blood can flow to and from the heart. When your arteries are narrower, your blood pressure will increase, which increases the risk of heart attack and stroke. Although it’s not proven that inflammation can directly result in cardiovascular disease, it’s common for heart disease and stroke patients to have high amounts of inflammation, so it’s important to monitor your inflammation biomarkers carefully. Cholesterol is a waxy substance that is found in all the cells of the body. You need some cholesterol to make hormones, vitamin D, and substances that help you digest foods. There are two different types of lipoproteins that carry cholesterol throughout your body: low-density lipoproteins (LDL) and high-density lipoproteins (HDL). High levels of LDL can result in excess cholesterol in your arteries, which are the blood vessels that carry blood from your heart to your body. Eventually, LDL cholesterol can enter your blood vessel walls and begin to build up under the lining of your vessels, restricting blood flow. In contrast, HDLs act as cholesterol scavengers, carrying cholesterol from other parts of your body back to your liver, which removes it from your body. If you have been diagnosed with high cholesterol, it means that you have too much cholesterol in your blood. This condition usually has no symptoms, so it’s difficult to tell if your cholesterol levels are healthy. The best way to learn about your cholesterol levels is to get your blood tested at your annual physical or from a blood analysis program like InsideTracker, which measures total cholesterol, LDL cholesterol, and HDL cholesterol. The higher the level of LDL cholesterol in your blood, the greater your risk of poor heart health. Similarly, the higher levels of HDL you have, the healthier your heart is likely to be. Your LDL cholesterol should be less than 100 mg/dl and your HDL levels should be at least 40 mg/dL for men and women. InsideTracker will tell you what your optimal range of total, LDL, and HDL cholesterol should be based on your unique demographics and fitness goals (you can view the free DEMO here). What is the connection between inflammation and high cholesterol? When excess LDL cholesterol seeps into the inner portion of your artery walls, it triggers an inflammatory response, and white blood cells rush to protect the damaged area. Areas of cell damage attract fatty substances, blood-clotting materials, and those white blood cells. When these materials accumulate, plaque (which is a combination of fatty substances, cholesterol, cellular waste products, and calcium) can form, which can result in even more hardened arteries and another cycle of inflammation. So, while inflammation is sometimes a protective and healing process, too much cholesterol can lead to a continuous state of inflammation, which is not beneficial for your arteries and your heart. What can you do about your cholesterol and inflammation levels? One of the most important steps you can take to improve your heart health is to know what’s happening in your body. The best way to determine your cholesterol and inflammation levels is to get a blood test done, like the one from InsideTracker. What you eat also can have a huge impact on your heart, and you can decrease your risk of heart disease by avoiding foods that are high in unhealthy fat, calories, sugar, and salt (such as fast foods). Some foods, however, help to decrease inflammation, including garlic, grapes, herbs and spices, soy protein, nuts, olive oil, black and green teas, and vinegar. In order to lower your cholesterol, you can replace unhealthy fats (such as saturated and trans fats) with healthy fats and replace refined carbohydrates with whole grains. If you have high cholesterol or inflammation, make sure you work with your health care provider to monitor your progress. Eating nutritious foods, along with getting regular exercise, can go a long way in helping you to keep your heart healthy!